CRAIG FROM CRAIGSLIST: Grover Norquist joins Open Debate Coalition? GOTHAMIST (New York blog): Change for Future Presidential Debates? 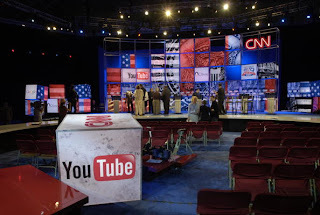 The bi-partisan group of online activists pushing to liberate debate footage from copyright restriction, and more broadly to remold presidential debates for a new age, says it will involve itself in other debates in the off-years, and gear up for 2012. The conservative activist Grover Norquist is also joining the group, he said last night. "I'm happy to join the Open Debate Coalition in calling for dismantling the Commission or fundamentally reforming it so it is accountable to one constituency only: the public," he said in an email. "And, if the Commission wants to show any bit of responsiveness this year, they'll make sure that debate footage is put in the public domain so people can put clips on YouTube and otherwise share key moments without being deemed copyright lawbreakers." Norquist also tells us: "There is no excuse for the Commission imposing their will on the debates, despite the wishes of both major party candidates and a broad grassroots coalition on the right and left." If you'd like to join our open debates movement, sign up now in the yellow box on the right of this blog, or at the bottom of this post. We clearly have big momentum. The Commission on Presidential Debates messed up big-time by completely ignoring the will of the people, and McCain and Obama, when it came to the "open debate principles" our coalition proposed. So now, the Commission must go -- and be replaced by a debate process that's democratic, transparent, and accountable to the people. Welcome Washington Post readers! If you want to join the movement that is helping to make our presidential debates more "of the people" than ever before, just sign up at the yellow box to the right. For those who have no idea what that's talking about, Jose Antonio Vargas -- writing at Washington Post's The Trail blog -- summarizes the Open Debate Coalition's progress and gives a preview of the future. Namely, fundamental reform of the Commission on Presidential Debates' top-down model and transition to a bottom-up model that is accountable to the public. Last week, following the second presidential debate, a broad, bipartisan group of online thinkers and activists called the Open Debate Coalition asked McCain and Obama to help adopt the principles of "open debate." That means people should be allowed to share debate moments on YouTube and other video-sharing sites without being charged as copyright lawbreakers. It also means that bottom-up voting technology should be used to allow people to ask questions of the candidates -- taking some power away from producers and journalists and giving it to everyday voters. In short, an updated and interactive debate format that runs counter to what's been implemented by the Commission on Presidential Debates (CPD) thus far. To the chagrin of online activists -- including the founders of Craigslist.org, Wikipedia.org and the heads of MoveOn.org and RedState.com -- their principles have taken a backseat. Though Obama and McCain, in letters to the coalition, agreed to the principles, the commission did not adopt them. MoveOn's Adam Green told The Trail that "2008 will likely be the last year that the Commission on Presidential Debates will exist as we know it. In the future, voters will demand interactions with the candidates that are democratic, transparent and accountable to the public." Andrew Rasiej, founder of Personal Democracy Forum, said: "Four years from now, the public's use of the Internet to connect with each other and organize around like-minded interests will force the candidates and the debate commission to significantly abandon the limited format of televised debates and move more of the discourse from the scarcity model constraints of TV to the limitless potential and abundance the Internet offers." "Hopefully," Rasiej added, "comparing the 2012 debates to those of 2008 will be like comparing a 5th generation iPhone to a bullhorn." Amen! So again, if you want to be part of the movement that makes that happen, be sure to sign up at the yellow form to the right. There are two other sites worth checking out, both from Open Debate Coalition partners. Billy Hallowell has a new site www.TransparencyMatters.org and David Colarusso has a great bubble-up voting site at www.CommunityCounts.us. Today, as reported in Politico, the Open Debate Coalition released the following letter to Senator McCain and Obama -- asking them to follow through on open debate principles in time for the October 15 debate. Thank you for your recent letters affirming our coalition’s open debate principles, designed to make this year’s presidential debates more “of the people” than ever before. As we approach the final debate on October 15, we ask you to proactively implement such principles right away. The closed nature of the recent debates has been universally criticized. The editors of Politico wrote, “The presidential debate commission’s rules are a scandal” resulting in “a format designed to limit improvisation, intellectual engagement, and truth-telling.” 83% of Obama supporters and 75% of McCain supporters agree that tough follow-up questions were lacking. Even Saturday Night Live spoofed the lack of follow-up questions in the debates, and the watered-down “town hall” questions chosen. 1) That the debate moderator has broad discretion to ask follow-up questions after a candidate’s answer, so the public can be fully informed about specific positions. 2) That after a “town hall” debate full of questions handpicked by the moderator, none of which were outside-the-box, you will allow Bob Schieffer to ask some Internet questions voted on by the public in the fashion outlined in our previous letter – which you agreed to. Existing technology will make this easy. 3) That, as a stipulation of the next debate, the media pool must release all 2008 debate footage into the public domain – as you agreed would be in the public interest. CNN, ABC, and NBC agreed to release video rights during the primary, and CBS agreed more recently. But Fox threatened Senator McCain for using a debate clip during the primary, and NBC invoked copyright law against Senator Obama to stifle political speech recently. The public deserves to know debate video can be reused without fear of breaking the law. 4) That you agree to work with the Open Debate Coalition after the election to reform or create an alternative to the Commission on Presidential Debates, so that the debate process is transparent and accountable to the public. Despite both of your agreement with the open debate principles, the Commission did nothing to implement them – or even to engage in dialogue about potential implementation. Also, the “31-page memo of understanding” with debate rules is nowhere on the Commission’s website, and has not been turned over despite requests. The signers of this letter don’t agree on every political issue. But we do agree that in order for Americans to make the best decision for president, we need open debates that are “of the people” in the ways described above. You have the power to make that happen, and we ask you to do so. Big News! Obama and McCain agree to Open Debate Coalition principles! On September 25, 2008, Prof. Lawrence Lessig, the founders of Craigslist and Wikipedia, and a left-right-techie motley crew launched the Open Debate Coalition. This was an effort to bring the presidential debates into the Internet age and make them more "of the people" than ever. There were two specific proposals: First, debate footage should be put in the public domain so that citizens can freely share it, blog about it, and put it on YouTube without fear of being deemed a copyright lawbreaker. Second, existing Internet voting technology should be used to allow voters to just just ask questions, but help select them. Big news! Both candidates agreed with the Open Debate Coalition's principles! Read Obama's letter here and McCain's letter here. Did any of this pass quietly into the night? Nope! Check out the big splash below! Tonight's debate is officially on -- and a group of academics, Internet pioneers and technology advocates are asking the candidates to "open up" the debates to the public rather than being "controlled by the media." Currently, the job of designing and choosing questions is left to the media host. During the primary season some debates chose from questions submitted online, but the letter writers say those chosen were "gimmicky and not hard-hitting enough." They prefer use of bubble-up Internet technology, which they call "the essence of the internet as we know it." The letter calls on the candidates to commit to "a principle that whenever you debate publicly, the raw footage of that debate will be dedicated to the public domain. Those in charge of the video feed should be directed to make it free for anyone to use." BROADCASTING & CABLE: Group Pushes for Rights to Debate Footage; Open Debate Coalition seeks more Internet-friendly debates, rights to video footage. A coalition of groups from both sides of the political spectrum asked the presidential candidates to pledge to hold more Internet-friendly debates, including requiring media companies to release rights to video footage. We're experiencing a great movement towards networked, grassroots democracy, and anything citizens can do to promote that is good for the country. The Open Debate Coalition's principles mark a significant step forward in that direction. We think we’ve found a good opportunity to bring some much needed reform and in the process once again demonstrate our tripartisan nature. We’ve teamed up with individuals on the left (including Moveon.org) along with others on the center and the right to sign a letter to support transparency in terms of the content and questions asked during the debates. A truly open debate would allow the public to select the questions, added Mindy Finn, a Republican online strategist who signed the Open Debate Coalition letter. The YouTube debates took an important step forward, "but the media still chose the questions, leaving the people out [of] the process, again," she said. "It's not enough to feign interest in the people's opinion, you have to walk the walk by giving the voters the chance to see their most important questions asked, the ones that the greatest number of people care about. Otherwise, it's a faux open debate." At the "town hall" debate scheduled for October 7, the questions are already promised to be from the audience or people on the Internet--not the moderator. Even so, the debate organizers should choose the top 25 questions that "bubble up" on the Internet "to ensure that the Internet portion of this debate is true bottom-up democracy," the letter says. A group of plugged-in politicos recently petitioned the Commission on Presidential Debates to open up the general election debates to the public. In addition to asking that the CPD to make the video feed of the debates freely available, the group asked the commission to allow the public to select the questions to be posed to the candidates. GLENN REYNOLDS (INSTAPUNDIT): Just call me "Mr. Diversity"
The letter's signatories are a disparate group seldom found agreeing on much. They include Lawrence Lessig, Glenn "Instapundit" Reynolds, Craig Newmark (of the eponymous List), Arianna Huffington (of the eponymous Post), RedState cofounder Mike Krempasky, Wikipedia's Jimmy Wales, MoveOn executive director Eli Parisier, and former Bush/Cheney eCampaign director Patrick Ruffini. The authors of the letter would like the ability to let the most popular questions "bubble up" to where they would be used in the debate. Good luck to posters on this blog. They are the side of the good guys - a category that bypasses those hoary conceptions "left" and "right," which should have gone out with "Twenty-three skiddoo." Read the letter in support of "Open Debate" principles that will bring presidential debates into the Internet age. Then, join the Open Debate movement today!